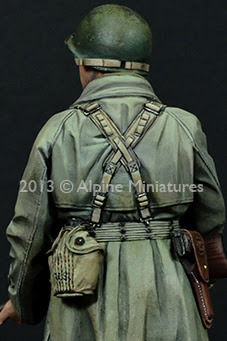 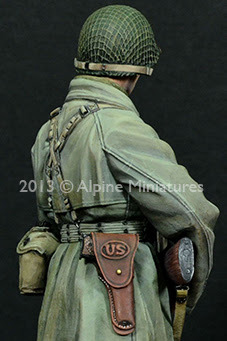 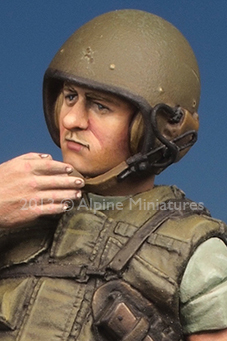 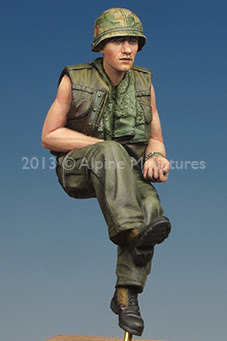 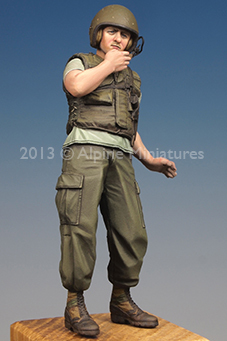 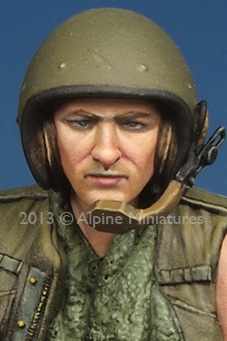 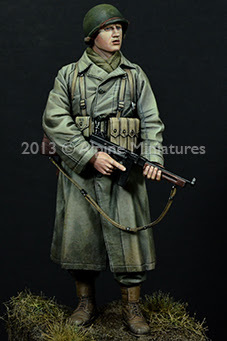 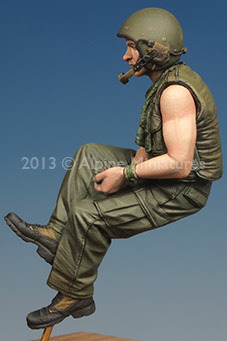 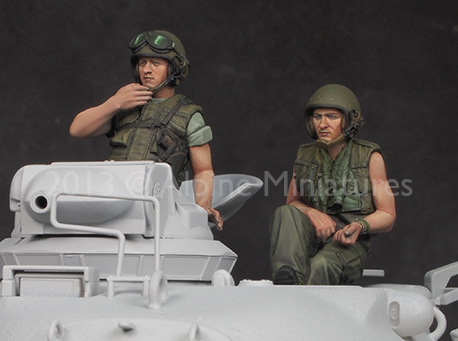 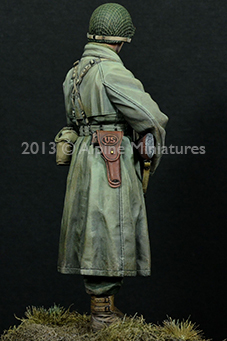 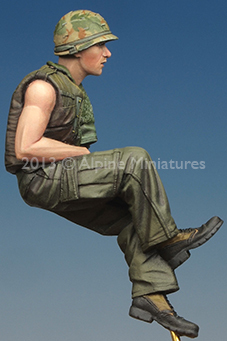 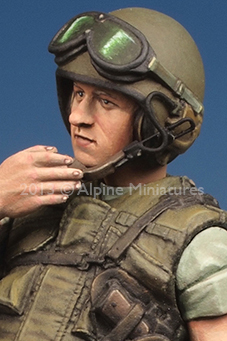 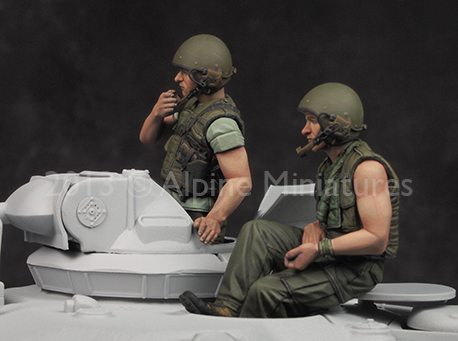 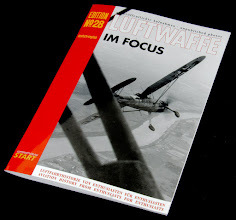 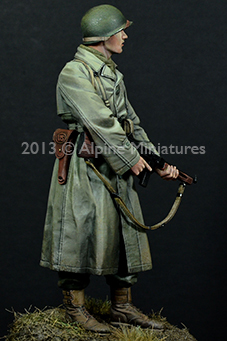 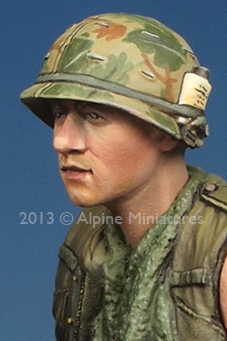 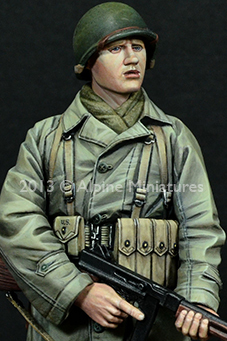 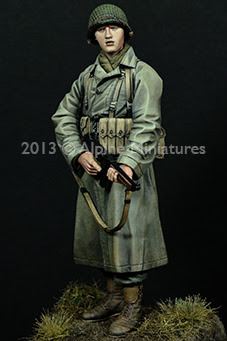 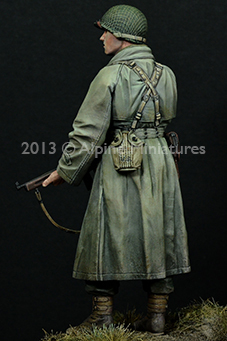 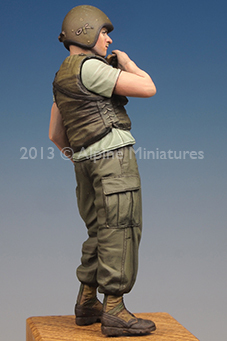 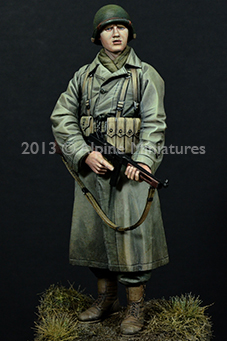 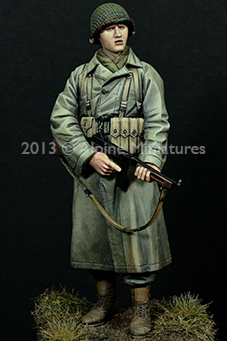 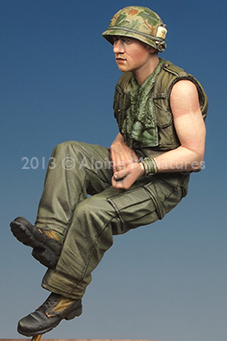 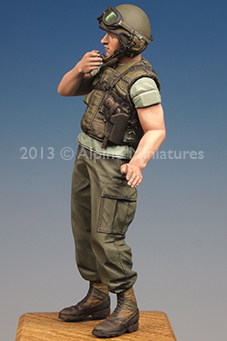 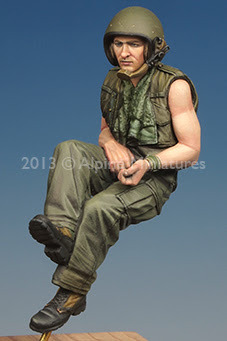 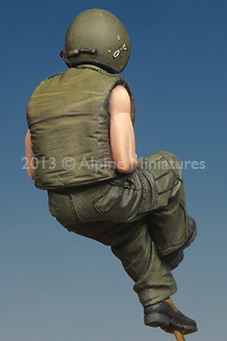 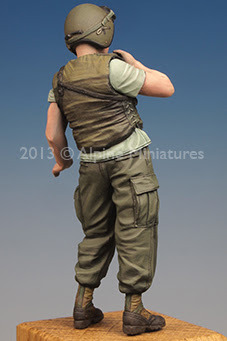 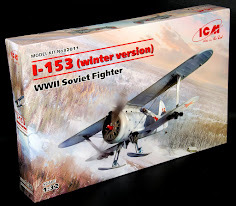 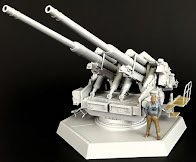 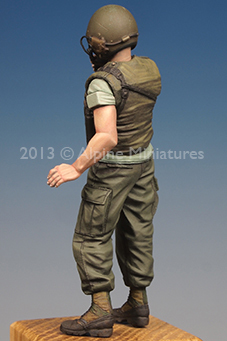 Alpine takes a worthy detour from the regular WWII figures this month with a pair of Vietnam tank crew – both riding their vehicles – sold as a set and individually – while the customary 1/16th release is of a US NCO holding a Tommy-gun back in WWII – we have some good pics and info from both to show you what is inbound.. 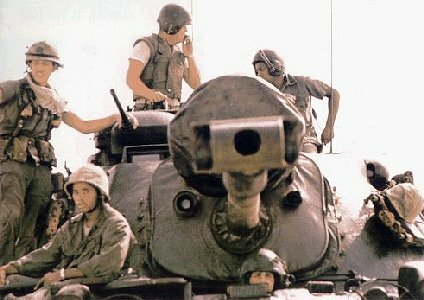 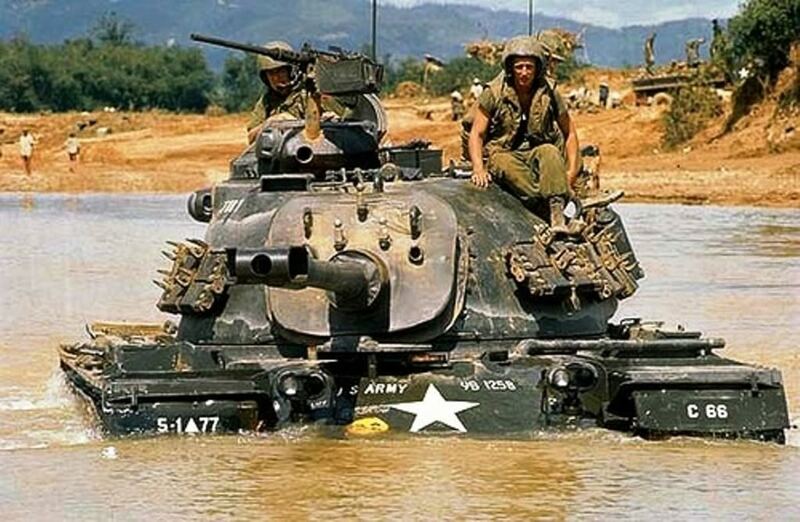 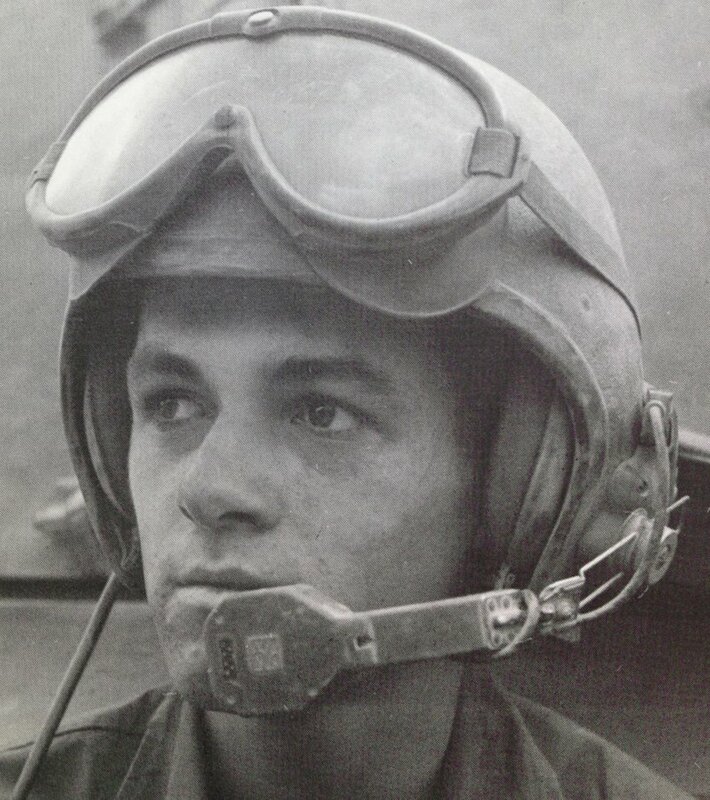 Captured standing in the turret of his tank – this Vietnam era crewman is leaning off to the right and talking into his radio mic to either his crewmen or to his platoon mates in other vehicles. 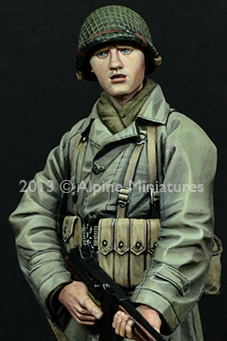 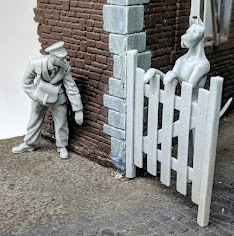 He is sculpted by Alpine’s head man Taesung Harms and you can see he has used quite a lot of his skillset on this and both his companion piece. 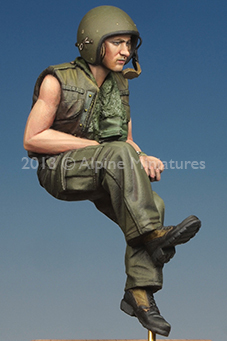 Delicate folding in the combat pants and his bullet proof vest with his rolled up T-shirt over his cigarette packet just adds to the well sculpted boots and nice sculpting on the hands and equipment. 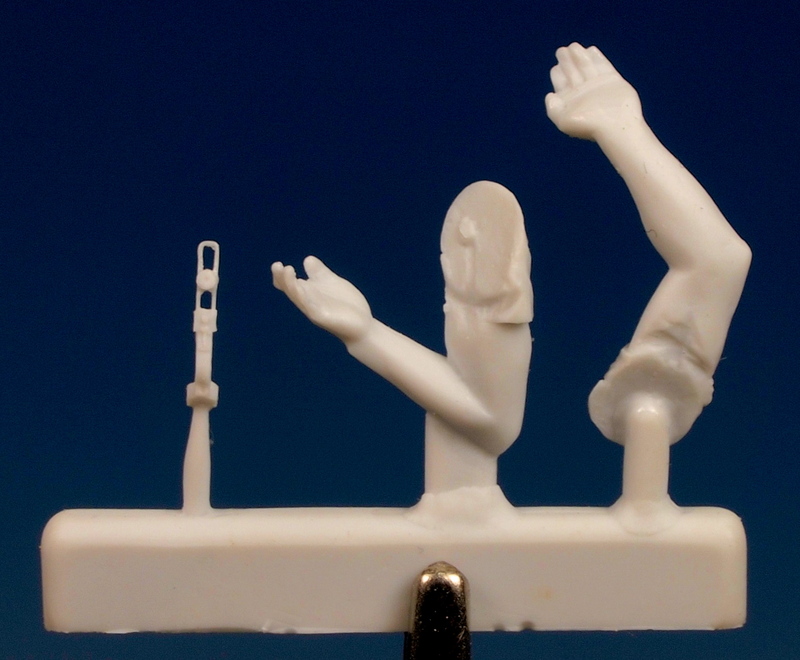 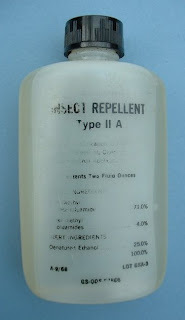 Delicate as well is his radio mic - a fine piece for a resin sculpt - seen here on it's casting with the arms - take care! 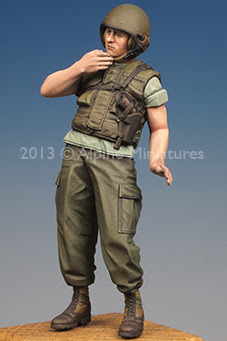 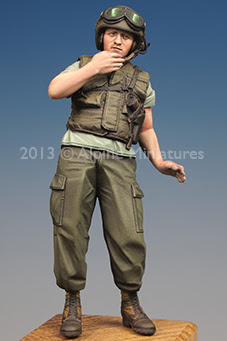 Speaking of equipment he carries a self-defence pistol in a holster on his torso as well as a choice of two heads – both wearing a tanker’s helmet but one has goggles moulded into it. 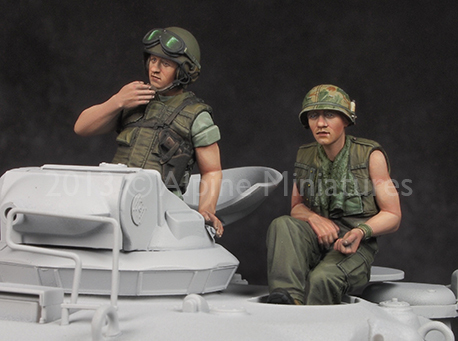 Seen only with his Flak jacket and combat pants and jungle boots – this tanker looks like he is feeling the heat of South East Asia and is bare skinned otherwise. 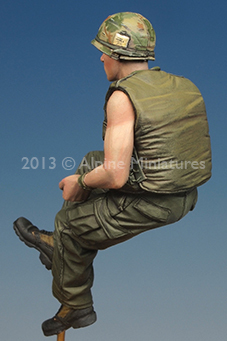 He certainly looks very much like he is a passive passenger! 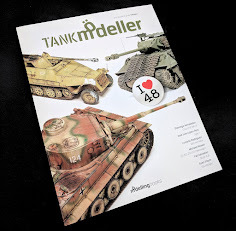 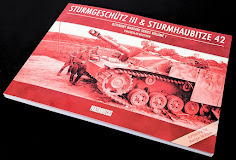 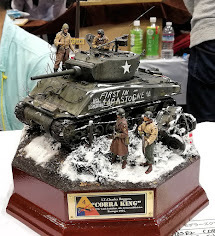 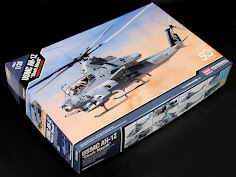 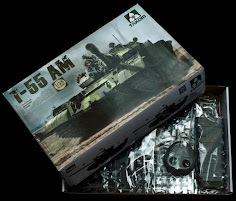 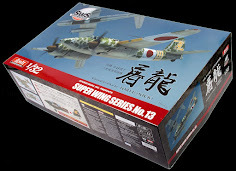 There are several shots of Vietnam era tankers in their AFV’s that I think could serve as good fodder for your painting inspiration – I know that this set was painted by Dr. Jin Kim – and he really did bring them both to life – congratulations to him for the excellent job on these! 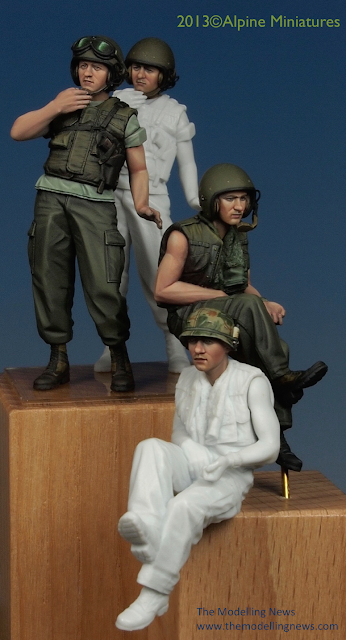 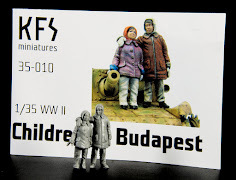 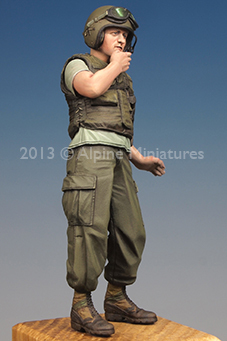 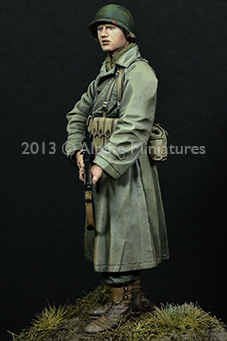 This large 1/16th scale figure is sculpted by Dmitry Shevtsov and painted in this instance by MH Hwang. They have brought some life to this resin sculpt alright. 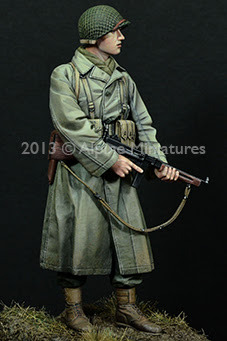 The US WWII NCO looks like he is from the colder European front as he wears a warm scarf on his neck under his large winter overcoat. 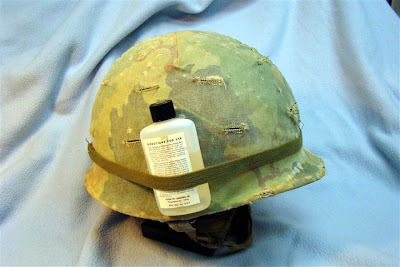 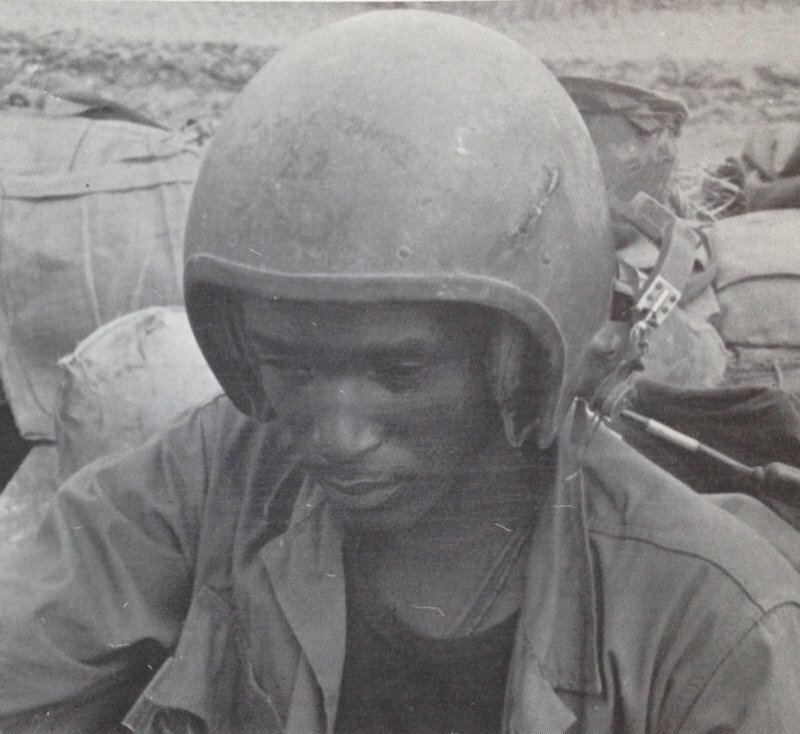 He has the choice of two headgear – both US M1 Helmets but one has the simple strap over it whilst the second choice has a camo net on it. 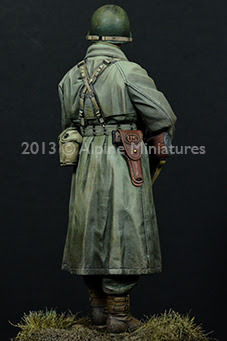 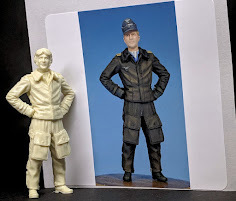 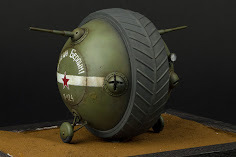 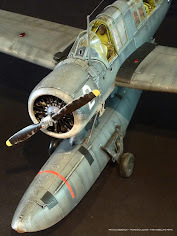 He has regular issue boots with galoshes into which his pants are tucked into, his large overcoat which sits under his webbing and several spare ammo pouches for his Thompson machine gun. 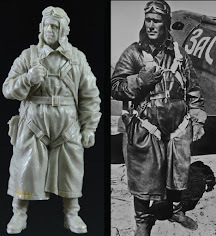 He would be a great companion piece for alpine’s earlier 16012 BAR Gunner US 29th Infantry Division which is similarly sculpted and dressed.